We have extensive experience in designing award winning environmentally sustainable libraries. The two-story, 31,000 square foot Mary D. Pretlow Anchor Branch sets a new standard for library services in Norfolk – a community oriented facility filled with the latest library technology. Features include the Teen Zone with 20 computers, big screen TV, activity center and lockers. A large adult computer center with 40 PC’s can remain open after hours. Public meeting rooms seating up to 100 are equipped for teleconferencing and distance learning programs. Four study rooms will accommodate from 2 to 12 people for group study and small meetings. The 10,000 square foot second floor Children’s Library is an abstract, underwater fantasyland designed to support the Family Place Library programs which advance literacy for parents and children from birth to 10 years old. The Early Childhood Learning Center includes a Program Room, Playscape for toddlers, as well as 20 computers and a large book collection. The Design Collaborative was commissioned to design a 95,000 square foot Central Library emphasizing library technology, flexibility, energy efficiency, economy and value. Public service areas are located on the ground floor and mezzanine levels. 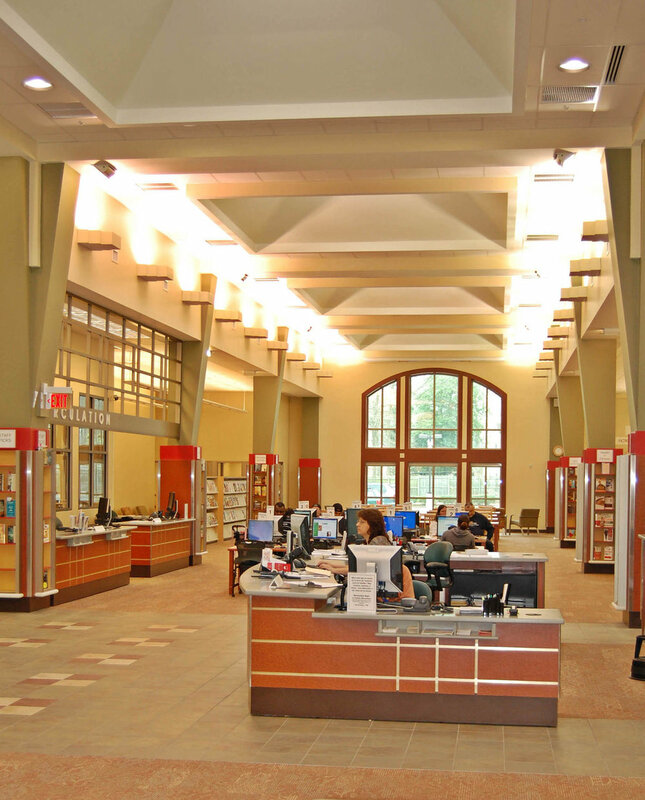 Open planning allows maximum flexibility in arranging furniture and equipment, makes library services more visible and accessible, and allows full service operations with a smaller staff. Meeting rooms and a 250-seat auditorium occupy a separate wing. This project has received 4 awards: Best New Building Award by Portfolio Magazine, 1988; Award of Honor for Architecture by the Virginia Beach Arts and Humanities Commission, 1988; and Energy Design Award by the Virginia Society of the American Institute of Architects, 1987. Most recently, it was selected for the VSAIA Test of Time Award, 2012. After 15 years of heavy use, The Design Collaborative was engaged to redesign the interior space plan and renovate the building. Replacement of finishes, updating systems and replacing worn out furniture were primary tasks. The work was phased so that the library remained opened through most of the construction. A number of areas were reconfigured to better support new services. The North Courthouse Road Library design team evaluated both modern and traditional designs. With the Library located near historic Richmond, Virginia, there was strong interest in the traditional American Colonial style of architecture utilizing features such as red brick, white framed windows, arches, and columns. On the other hand, the desire to provide views and an open, light filled interior favored a modern design which would allow for much larger windows than are normal in a traditional architectural style. The team’s final choice was a traditional brick building with appropriately sized windows. To provide an enhanced light filled interior experience and to save energy, high-tech energy efficient prismatic and tubular skylights are used in almost every occupied room. Everyone is pleased with this end result which achieves the best of both worlds! The Farmville Prince Edward County’s Community Library is a 20,000 SF state-of-the art main library located in a public park at the edge of Wilck’s Lake in the Town of Farmville. The Library interior showcases views to the adjacent lake from the adult, teen, and children’s areas. Large glass windows open directly onto a lakeside patio. Roof top clerestory windows bring abundant natural light into the library’s large central atrium space. A “thru-the-looking-glass” theme informs the children’s area with a variety of mirrors, “rabbit holes” and fantasy picture frames prominently featured. Public areas are organized within sight and easy walking distance of the staff desks to allow maximum service with a minimum of staff. Library service features include a multipurpose meeting room, children’s program room, two group study rooms, computer lab, and special teen area with its own computers. Chesterfield County’s new Meadowdale Branch Library is a 20,000 SF state-of-the art branch library that replaces the existing library. Library service features include a large meeting room, two group study rooms, a computer lab, and two individual quiet study rooms. Special built-in kiosks facilitate browsing and displays in “found” space around the structural columns. The Library interior showcases abundant natural light and views. Special light diffusing skylights and special sun-control roller shades ensure a glare-free visual environment. Extra attention was made to place all the public seating and computers within sight and easy walking distance to the staff service desks. The meeting room opens directly into the library both visually, with large glass doors and windows, and literally with sliding glass doors that open wide to invite informal use when events are not scheduled. Easily movable furniture encourages patrons and staff to set up the room to serve a variety of functions from study and reading to small meetings to lectures. Complete collection capacity is 85,600 items. Currituck County’s new Moyock Branch Library is a 7,500 sq. foot library that combines the best of traditional coastal architecture and state-of the art public library services. This new facility has been master planned to shared a 6 acre site with the Historic Kight Farm House and outdoor recreation features including a Discovery Garden and Senior Citizen’s walking path. The library design harkens to Currituck County’s rural traditions. Like many public buildings from the 19th Century natural daylighting is utiltized to good effect creating both a delightful interior and energy savings. Library service features include a public meeting room, a computer lab, and adequate staff work spaces. A flexible exhibit/function space is shared with the Cultural Arts Council. The library interior is organized around a highceiling daylighted atrium space. At the library perimeter, windows of seating areas take advantage of views and natural light. The furniture layout enhances staff’s ability to observe patrons and ensure that they are being served. This new Library is planned to be adaptable to future changes in library services and technology.